The highlight of it all was an evening at Pollen Street Social with Carnivorous Fiancé. I’ve wanted to eat there for ages and thankfully the restaurant didn’t disappoint, from the endless supplies of beautiful homemade bread (so important for first impressions, but sadly something so many places get wrong) to the tiny personalized cake and card they brought over at the end of our meal after discovering that it was my birthday. I’m sure what you really want to hear about dessert so here’s what I ate: 70% Chocolate ganache with banana ice cream, sesame crumble, Pedro Ximenez and chocolate coral. The ganache was ridiculously rich, the crumble like the best rice krispie cake you’ve ever eaten and the Pedro Ximenez appeared as sticky little dots of Christmas pudding-like gel. The coral – which when observed on other peoples’ tables appeared to be firm and crunchy and, well, coral-like – was in fact a sort of semifreddo, moulded into the most amazing shape. The plate was a complete work of art, something I could absolutely eat with my eyes (before greedily spooning into my mouth). But the thing which really won my heart, which blew me away in the way that only something so understated and unexpected can do, was a simple pre-dessert of camomile and cantaloupe granita with a yoghurt lime foam, the floral tea and sweet, aromatic melon combining in ice cold crystals to create the most perfect palate cleanser. This recipe is my attempt to recreate that sweet at home and I hope that you’ll love it as much as I do. Don’t be put off by the Michelin-starred inspiration: this is absolutely a simple dish to make at home. 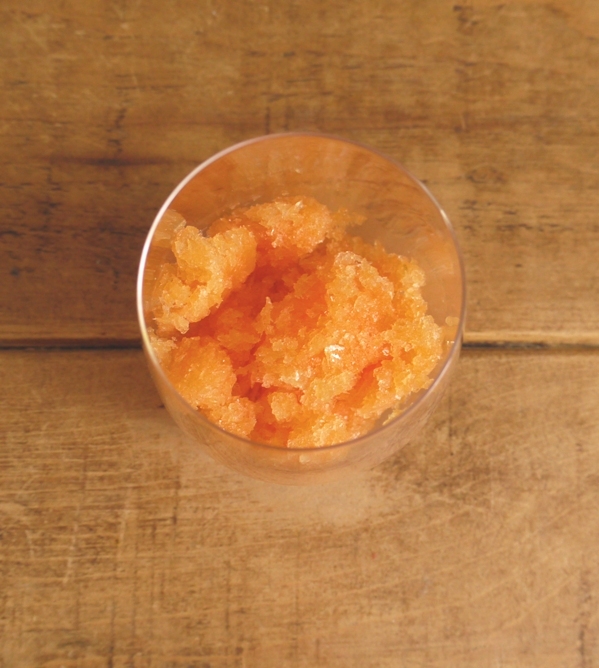 Granita is something that anyone can whip up with a freezer and a little bit of patience (no ice cream machine needed!) and I defy you not to fall for the honey chamomile syrup, even if you don’t get as far as blending it with melon and freezing the whole lot into this beautiful ice. I have absolutely no desire to make my own foam at home but this creamy citrus mousse is a more than suitable substitute for what we ate in the restaurant. Something about the fat in the dairy combined with the sweet ice crystals of granita allows the flavours to linger longer on your tongue, creating a mouthful that is both comforting and refreshing all at once. If you end up with any leftover granita, as I did, it’s wonderful softened and slurped as a sort of iced tea slush puppie, or stirred into Greek yoghurt at breakfast time, if you’re that way inclined (I am). In a small saucepan, bring the water to the boil. Remove from the heat, add the teabag and steep for 10 minutes. Remove and discard the teabag, stir in the honey and bring to the boil. Simmer until reduced slightly, about 5 minutes, to create a simple chamomile syrup. In a blender, blitz the melon until smooth. Add the camomile syrup and lemon juice then blitz again. Pour into a shallow container and freeze. After about 45 minutes, rake up any ice crystals that have formed at the edge of the container with a fork then return to the freezer. Check every 30 minutes for another two hours, raking up the crystals each time to form a lovely icy granita. In a small heatproof bowl, combine the gelatin and water, stir then set aside. In a medium sized bowl, whip the cream to medium stiff peaks. In a separate bowl, whisk together the yoghurt, lime juice and zest. Whisk the honey into the yoghurt, if using. Heat the gelatin in the microwave for 12 seconds (or melt in a bain marie). Working quickly, pour the melted gelatin over the yogurt mixture and whisk to combine. Gently fold in the whipped cream until everything is blended then scrape into a container and refrigerate. 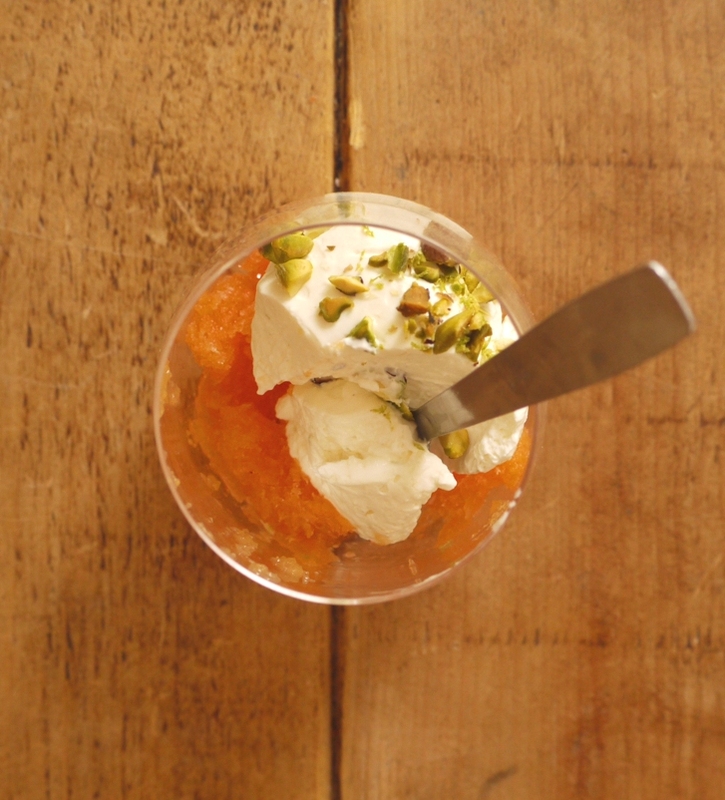 Divide the granita between six serving bowls or glasses (glasses look prettier so you can see the layered effect). Top with a scoop of yoghurt mousse then finish with a few chopped pistachios and a sprinkle of lime zest. I love the birthday week idea. I used to tell my husband that it was a birthday month, 🙂 The little birthday cake and card was such a lovely touch from the restaurant, such a nice ending to a meal. Great recipe! A birthday month sounds like a very good thing. I’m in. Pollen Street Social is great isn’t it I did a tasting menu there last year and adored every course. I went to Social Eating House last Friday which was just amazing too, you must go! I had this strawberry mojito dessert which was amazing in its simple brilliance. Granita is next on my list to try at home, it looks so refreshing especially with it heating up again for the bank holiday weekend. Thank you! Granita is perfect if you’ve had trouble with ice cream, it really is as simple as raking up the ice crystals every so often 🙂 enjoy! Yum! That mousse sounds delicious! Like a fancy dessert I had recently – might have to try that! Oooh I’ve been wondering if you’d share the recipe ever since I saw a photo of this on Instagram. It looks absolutely divine. Bookmarking this to try. Thanks Jennifer. Granita is such a satisfying dessert to make as it’s so incredibly simple. Once you’ve made one base you can experiment with all sorts of fruits and teas and scale the sweetness up or down depending on your personal taste. A great way to celebrate your birthday, with multiple dinners/lunches !!! 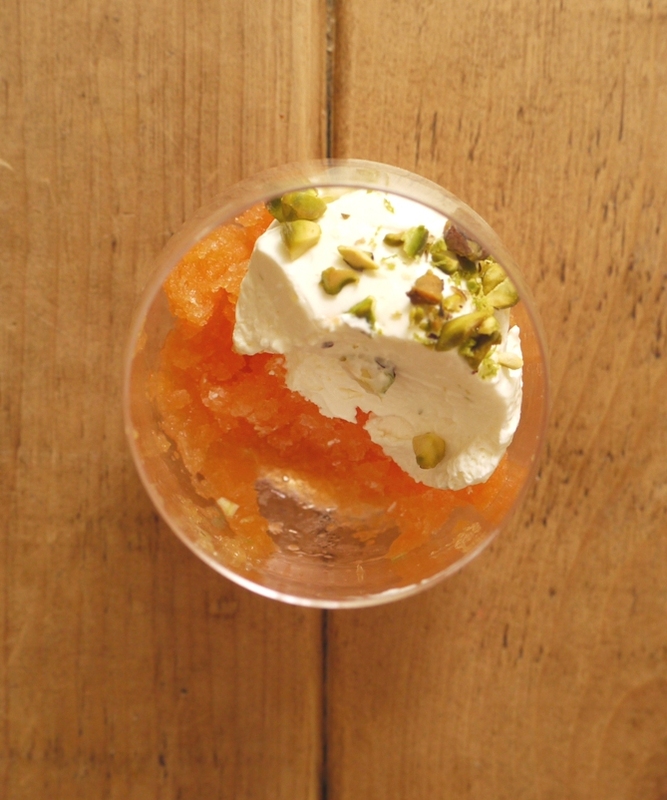 I think granita is really under-appreciated dessert, so thanks for this lovely recipe ! I love this – so elegant! A lovely summer dessert! First, happy birthday Kate! I can well imagine how good this is if you prefer it to that cute little chocolate gift. Such an interesting combination of flavors! I haven’t made granita in ages. Thanks Paula. The chocolate dessert was fab but the granita was so light and refreshing. Loved the fruit/tea combination too. I still haven’t been to PSS – this just confirms that I really need to get down there soon! What a lovely and refreshing combination of flavours and I like the sound of that lime & yoghurt mousse in particular. 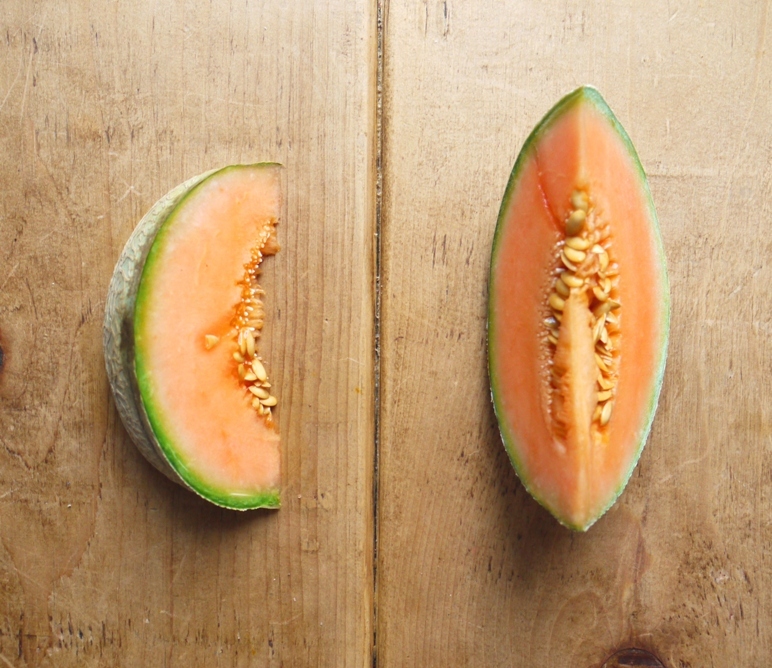 Even though I hate cantaloupe, this looks incredible. Love the pistachios on top. Well…I’ll enjoy looking at it, and probably eat the topping, can’t promise about the cantaloupe bit though. If looks were everything though, you’d have me! This sounds insanely good, I really want to try this at home! This looks so elegant yet simple, I’d love to try this. Happy 29th! Your meals at PSS sounds like the perfect way to celebrate a birthday and I love the sound of both your palate cleanser and your dessert there. Glad you managed to stretch out your birthday celebrations for that long – I turned 29 earlier this month as well and managed to stretch the celebrations out to a good 4 days! Ooh yes, this would be the perfect thing to make! I saw a camomile and honey bundt cake on a blog recently too which looked gorgeous. Hope you’re having an amazing time in Bali! Really enjoying our vacation – Bali is a wonderful place! Moving on to Seminyak tomorrow, looking forward to some more beach time and some retail therapy before we end our trip with a few days in Singapore! I like the sound of that Bundt cake – I was actually wondering whether the syrup could be used to make a honey and chamomile sticky cake … Like a herbal twist on a lemon drizzle cake. Might have to investigate when I get back! So I have experimented a little bit since getting back and the syrup is indeed wonderful drizzled over a cake. In the end I sweetened the syrup with plain sugar as I found the honey overpowered the delicate chamomile cake when I first made it (possibly down to the honey I had to hand) and poached some pears in the syrup before reducing the syrup by half and pouring over a chamomile kamut pound cake. Tasted absolutely divine with some creme fraiche on the side so thank you for the inspiration! Happy belated birthday and what a great lot of celebrations including going to Pollen Street Social and sampling such amazing sounding desserts. Your version does sound so summery and not too heavy either. I would never make my own foam either! This sounds so fresh and delicious. Cantaloupes are abundant now, and I love camomile. I’ve never had the two paired together, but I can imagine them tasting lovely together. It sounds like you had a very happy birthday meal and now a recipe to help you always remember it. Thanks Sacha. My last birthday of my twenties and as an unmarried lady – lots of big (and exciting!) changes coming soon! Happy belated birthday! 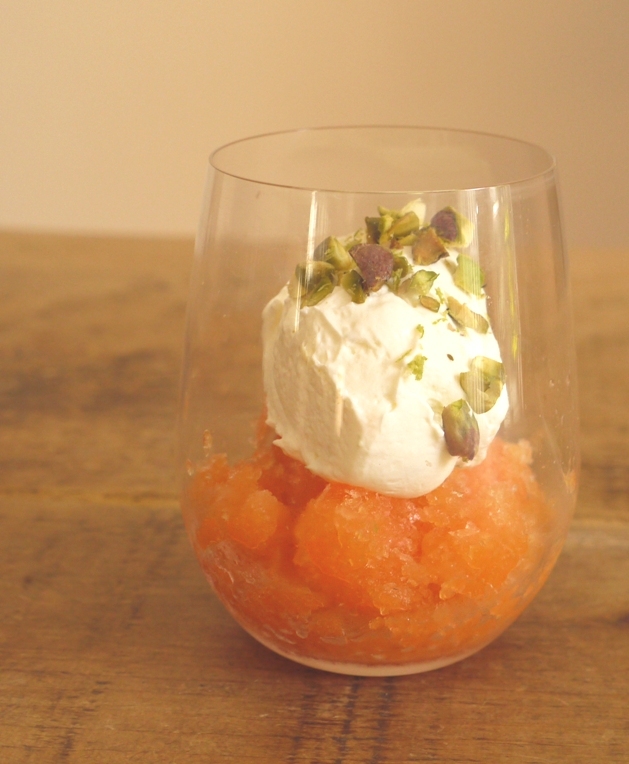 I love cantaloupe this time of year and the granita looks wonderful! So fresh, light and elegant. Happy belated birthday! If there’s anything I like better than dessert, it’s a pre-dessert…or any meal that has a pre-dessert, anyway. This sounds delightful! Catching up on your blog while you are anjoying Bali as a newlywed. This granita sounds incredible and I had to smile at the similarities of our middle of August: my husbands birthday, a meal in a Michelin-starred restaurant and a delicious palate cleansening sorbet we enjoyed there (plus a small surprise birthday cake).